The Golf R wagon has an R specific bumper with large air inlets, as well as bi-xenon headlights with integrated daytime running lights. Volkswagen will build a station wagon variant of its tuned-up Golf R compact car for the first time. 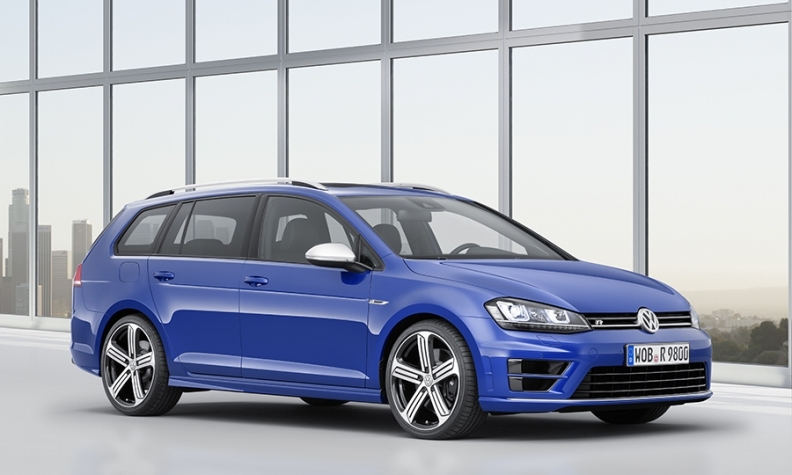 Like the Golf R hatchback, the all-wheel-drive Golf R wagon is powered by a 2.0-liter turbocharged gasoline engine that generates 296 hp and is combined with a six-speed dual-clutch transmission. VW says the Golf R wagon has the same enthusiast credentials as the Golf R hatchback, but with cargo room that is comparable to a crossover. The wagon accelerates from a standstill to 100kph (62 mph) in 5.1 seconds. Its top speed is electronically limited to 250kph (155 mph). Other performance-oriented features include a two-stage electronic stability control system that can be turned off for racetrack driving, rear diffuser, quad exhausts and R interior trim. Luggage capacity is 605 liters rising to 1,620 liters with the back seats down. The wagon will go on sale in Europe next spring. VW did not disclose prices but it is likely to cost 2,000 euros more than the Golf R hatchback, which starts at 40,250 euros in Germany. Unlike the Golf R hatchback, VW has no plans to sell the wagon in the U.S., according to a VW spokesman.